For more than a decade, the Mac mini has been the cheapest Mac. That’s still true, but now it costs eight hundred quid, which really sums up Apple’s direction of travel. Back in the day, the shiny plastic iMac was more fun than a mid range PC at a similar price, and its innovative USB sockets opened up a world of plug-and-play accessories. 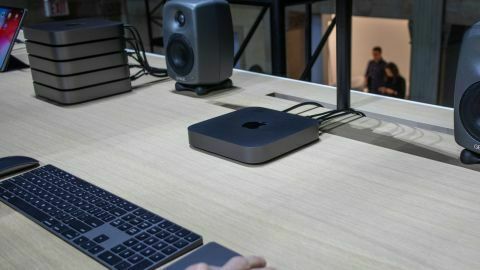 Today, the Space Grey Mac mini is about as much fun as a filing cabinet, and its USB Type C/Thunderbolt 3 ports are for high-end extras you can’t afford. This mini isn’t aimed at cash-strapped consumers. It’s for affluent Apple fans and IT managers who are spending someone else’s money. For the latter, ultra fast input/output and legendary reliability are worth as much as processing power. But what about the rest of us? Well, buys an i3 processor, 8GB of memory and a 128GB SSD. If you spent that on a Windows PC, you’d expect a 1TB hard drive and a decent graphics card too. But this 20cm square recycled aluminium slab has nowhere to put them. At least the basic model performs well. In our tests, its SSD was extremely fast and its quad-core i3 8100B processor outperformed many desktop i5s and laptop i7s. For more demanding work, you can buy a six core i7 version. A six-core i5 model is the mid-range option if you also go for a 256GB SSD. You can upgrade the memory yourself and pay less than half what Apple charges. In its favour, the mini is superbly engineered, runs very quietly, will last for years and can be expanded via Thunderbolt 3 without the fuss of internal upgrades. If you want to use macOS rather than Windows (or both, because you can install Windows 10 on it), this is the most affordable way to do it. But at 67 per cent more than its predecessor, it won’t win Apple many converts. Medion Erazer x5361 G review: All play and no work?